"Nature inspires creativity in a child by demanding visualization and the full use of the senses." Never before in history have children been more "disconnected "from nature. Today, children interact with the virtual world (i.e., computers, video games, television, etc.) far more than the natural one. Research shows that children need exposure with nature to support a healthy physical and emotional development. Connecting with nature also helps a child develop a better understanding of their self, community, and world. In 2011 Crestwood Primary & Intermediate Schools received the Northeastern Ohio Education Association Green School Award for their efforts to remedy this trend. Our nationally recognized schoolyard science program aims to reconnect our youngest learners with nature using place-based education ideas. The following explains how the program quickly evolved with the leadership of dedicated Crestwood teachers and community members. The consolidation of Crestwood's four elementary buildings in 2004 marked the beginning of the schoolyard science initiative. Unified on one campus, Crestwood Primary & Intermediate Schools began housing all students preschool to grade 5. Before its opening, kindergarten teachers' Lee Dean and Monica Chesla envisioned students connecting with their new school through nature. With the help of community members, they created "Planting for a Future," a proposal to build several outdoor learning gardens in their new schoolyard. In April 2004, they received a multi-year grant from the Hiram Community Trust to support the project. During 2004-2007, several learning gardens were installed around CPS, including a raised-bed Sensory Garden, Butterfly Garden, -Red, White, and Blue Garden, Memorial Tree Garden, Mulberry Tree Garden, a Sunflower House and more. Also a visionary, third grade teacher Rosemary Krupar received grant money from the Martha Holden Jennings Foundation to construct an Ohio Prairie Garden at Crestwood Intermediate School (CIS). With all these outdoor projects underway, -Dean, Chesla, and Krupar formed the Outdoor Education Committee (OEC), composed of teachers and community members to help manage the gardens and outdoor learning activities. In April 2005, the OEC launched their first community-wide Earth Day Celebration in an effort to promote environmental education in the early grades. Now held annually, this event has grown to 450 people visiting 25 learning stations that celebrate environmental appreciation, education, and understanding. From 2006-2008, ten Crestwood elementary teachers participated in "Science in the Schoolyard." This grant-funded graduate course, directed by Matt and Roxanne Sorrick of Hiram College, trains K-6 teachers on ways to use their schoolyard to conduct meaningful nature investigations with students. These investigations include plant and animal surveys, habitat investigations, migration patterns, abiotic data collection and more. As a result, teachers successfully expanded their schoolyard science program to include undisturbed natural areas on school grounds, such as the bio-swales. This wetland area is a series of retention pools created during the buildings' construction to control the runoff and pollution from the schools' rooftops and parking lot areas. Although this habitat was not created for educational purposes, it has since served as an ideal setting for ongoing nature investigations. Mr. Sorrick conducts several nature hikes with K-2 classes at the bio-swales each school year. In addition, several Crestwood teachers headed for the wild West for another influential course called "Environmental Science for Elementary School Teachers (ESEST), directed by Dr. Richard E. Lee Jr. of Miami University, Ohio. This grant-funded summer course for Ohio elementary teachers was held at Yellowstone-Grand Teton Parks in Wyoming. Throughout the duration of the course, fourteen Crestwood teachers were selected to attend this highly competitive program, with some returning twice, to develop a deeper understanding of botany, zoology, and geology concepts. These teachers include Rosemary Krupar, Cheryl Brugmann, Lee Dean, Monica Chesla, Kate Viers, Lorri Calapa, Gerrie Zimcosky, Cathy Corr, Traci Bivens, Teresa Skully, Barbara Komoff, Natalie Harr, Jane Stamm, and Betsy Siman. As a result, these teachers provided professional development to their fellow coworkers and created an environmental action plan for CPS. April is now celebrated as "Science month," with weekly themes that focus on the importance of soil and rocks, plants, animals, and earth conservation. 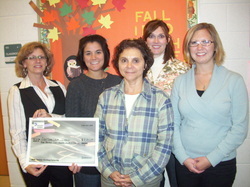 In 2009 Crestwood Primary and Intermediate teachers received $9,800 from the Dominion Education Partnership Foundation to implement a cohesive K-3 schoolyard science program. Led by teachers Amanda Curfman (kindergarten), Natalie Harr (first grade), Kate Viers (second grade), and Rosemary Krupar (third grade), students are Nature Detectives searching for the secret life of their schoolyard's natural environment. These students use real scientific tools (ex. collection nets, soil and air thermometers, binoculars, etc.) and technology (ex. digital microscopes, trail cams, dell mini laptops, etc.) provided by the grant to investigate specific areas of their schoolyard. Due to the cyclical nature of the project, this schoolyard science program continues to renew itself with each new batch of kindergarteners who enter Crestwood Local Schools. Since kindergarteners (ages 5-6) are just beginning to discover the world around them, our youngest Nature Detectives investigate their immediate surroundings; a small plot of the school's bio-swales habitat. First grade Nature Detectives increase their focus to include how seasonal changes affect the entire bio-swales habitat. Second grade Nature Detectives advance their study to examine the various habitats that comprise the schoolyard environment. In the culminating year, third graders focus on the habitats that form the community's ecosystems and watersheds. As students progress through the grade levels, the program expands on the previous year's information and builds upon the seeds of knowledge planted in these young learners' minds. Funded by the Hiram Community Trust in 2009-2011, Crestwood elementary students now have more outdoor eduction opportunities with the installation of a bio-swale land lab. Thanks to third grade teacher Rosemary Krupar, this pavilion is located behind CIS, providing students a well-needed outdoor workspace to observe and interact with nature first hand. 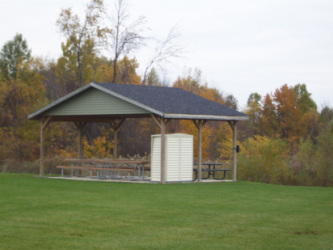 It is equipped with picnic tables, storage shed, a cart to transport learning supplies, new technology, and a handicap accessible sidewalk. In June 2011, CIS teachers Rosemary Krupar and Patty Timbrook held a week long summer camp called Nature's Art. The camp culminated with a nature inspired art show attended by the community. First grade teacher Natalie Harr and Dr. Richard E. Lee Jr. of Miami University co-authored Nature Detectives, a professional article recently published in the National Science Teacher Association's (NSTA) journal Science & Children. Using ideas from place-based education, the article presents a yearlong project conducted by Harr's first grade "Nature Detectives" that brings science, nature, and other curriculum standards to life right in their schoolyard. With a focus on journaling, this project is a novel way for teachers nationwide to promote nonfiction writing in their classrooms. In March 2011 Harr was invited to present the article at the NSTA National Conference on Science Education in San Francisco, CA. She brought back many ideas to further enhance the schoolyard science program. Impressed by Crestwood's dedication to environmental education, Dr. Richard E. Lee, Jr. invited Natalie Harr to be the first elementary teacher to accompany his Antarctic research team to Palmer Station, Antarctica. As a researcher on the 2012 team, Harr's main responsibility is to spearhead the research team's educational outreach program that showcases learning taking place in her own district. With a strong schoolyard science program already in place, Harr has worked closely with Crestwood teachers to connect their schoolyard discoveries to the remote environment at the bottom of the world. When students are afforded the opportunity to experience firsthand the wonders of their local environment, they can then begin to comprehend other complex and foreign environments, such as Antarctica. Harr hopes that the Crestwood-Antarctica Connection inspires students to appreciate the wonders of our natural world and to become stewards of this wonderful home we call earth.